Hi there! 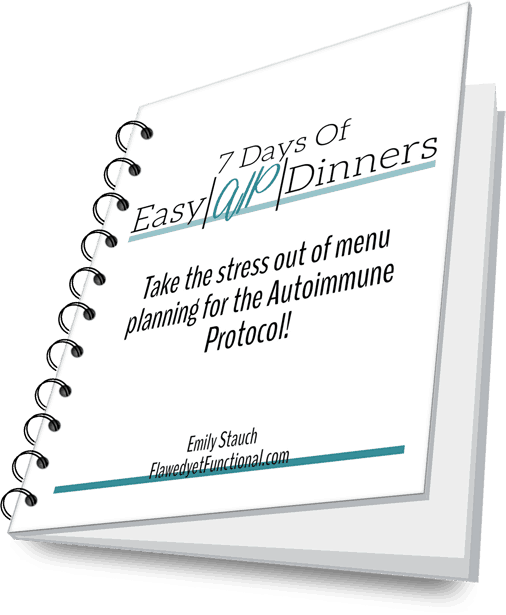 Welcome to Flawed yet Functional where I use food to heal my body and dramatically improve my autoimmune symptoms (very stable blood sugar as a Type 1 Diabetic!). Through my health journey, I’ve learned to develop my own recipes because I can’t eat the same dishes for long. I love variety! In the winter, I love to eat soup. Today, I’d like to share my latest creation with you: AIP Creamy Ham and Parsnip Soup. It’s dairy-free and gluten-free while still hearty, creamy and packed with flavor. Check it out! Soup is adored by my entire family. It is my go-to dinner at soon as the weather turns cool in the fall..or perhaps even before it begins to cool…sorry, family for making you sweat during dinner in the summer! I just love soup! While I’m working to reintroduce various vegetables into my diet, white potatoes are still off limits. I’ve been craving ham and potato soup lately, (This one was a favorite back in the gluten and dairy days!) but I wanted to keep the soup AIP-friendly. So I needed to use a starchy vegetable that would give a texture similar to potatoes. Parsnips are a root vegetable that resembles a carrot in shape, but it’s a yellow-tan skin with white flesh. When cooked, it has a soft, tender texture like that of a potato. Score! The flavor is not as mild as a potato though. It has a nice peppery flavor but not spicy like a horseradish. The next hurdle to my ham and “potato” soup was how to create a creamy, thick broth. I’ve tried thickening soups with tapioca starch or arrowroot powder, but I never like the consistency. It’s usually too thin. So just keep adding starch, you might say. Oh no. If you keep adding starch, it gets thicker but also gummier…kind of like snot. It’s so gross. Ruins a whole dish. You’re welcome for that visual, but you’ll thank me for that information the next time you try to thicken soup or gravy! So how do you make a stable, not too thick, dairy-free creamy soup? Puree part of the vegetables! Yes, my friends, it is that simple! Just puree part of the soup, leaving as many chunks as you like, then stir the puree back into the soup. The pureed vegetables create a creamy base that does not separate or turn overly gelled (Snot-like, if you will). For this soup, I went above and beyond to create the broth by making ham stock fresh that day. I know, over-the-top, right? It was an effort to not waste ham bones from making breakfast sausage, and it creates a super rich base for the soup. However, if you don’t want to go to that much trouble, just buy chicken stock from the store! But if you want to give your taste buds a party, make your own broth from ham bones. You won’t be disappointed. The ham bones I used are leftover from pork butts used to make our breakfast sausage, so they had a fair bit of meat on them. If your ham bones don’t have much meat or you bought stock from the store, substitute cubed ham steak for the meat. Ham steak can be filled with a bunch of preservatives and unknown spices. Choose your ham steak carefully if you are strictly AIP. In fact, I would use raw ham bones plus the excess meat only if in the AIP elimination period, just to be safe. Costco sells a nitrate-free ham that’s cured with celery salt and has all spices listed on it. You can find it near the deli meats. The best part? It was quite reasonable priced too! Score! Also if you choose to use ham steak, add salt sparingly until the ham is added at the end. Still salt as you go, but use smaller amounts. Ham steak will be quite sweet and salty compared to the raw pork on the ham bone. Salt with caution, my friends until the end! There’s nothing better than a thick, creamy soup on a cold winter day. I love making big pots of soup like this one not only for its comforting effect the day of, but it makes great leftovers for another meal or two! Try this AIP creamy ham and parsnip soup the next time you’re looking for the perfect meal on a winter night! This is ham and “potato” soup AIP style! Enjoy this dairy and gluten free soup today, and you’ll be completely satisfied by this hearty, filling soup. In a large stockpot, combine all ham bone stock ingredients. Cover and bring to a boil over high heat. Reduce heat to keep a simmer and cook for 4-6 hours. Add more water as needed. At the 4 hour mark, check if the meat will easily come off bone. If so, remove the meat, chop, and set aside. Return bones to the stock, cover, and continue simmering until time to make the soup. Line a rimmed baking sheet with parchment paper. Lay 6 ounces of bacon out on parchment in a single layer. Bake at 400° for 20-30 minutes or until crispy. Remove from pan and allow to cool on paper towels. Chop when cool and save for garnish when serving the soup. Chop the remaining 6 oz. of uncooked bacon. In a 6 quart dutch over, melt 1 tablespoons of bacon fat. When the pan is hot, add the sliced leeks and chopped bacon and cook until fat is rendered and bacon is crispy. Leeks should be quite browned too. Remove bacon and leeks from pan and set aside. Melt 2 tablespoons of bacon fat in the same dutch oven. When the pan is hot, add the chopped yellow onion and cook until just browned. Stir in the parsnips, garlic, thyme, bay leaves, salt, and pepper. Bloom for 30 seconds or until fragrant. Pour in 6 cups of ham broth. Bring soup to a boil, reduce heat to low, and simmer covered until parsnips are soft, 8-12 minutes. Puree half the parsnips along with some broth and the bay leaves. Process until very smooth. Pour pureed parsnips back into the dutch oven. Add the chopped ham, crispy leeks and bacon, and lemon juice to the soup. Warm then taste for salt and pepper. Add salt until the soup comes alive! If it tastes dull or flat, add more salt! Serve with chopped green onions and additional chopped bacon.